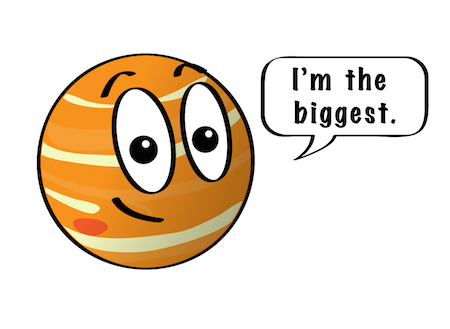 ​The most massive planet in our solar system, with four planet-size moons and many smaller satellites, Jupiter forms a kind of miniature solar system. Jupiter resembles a star in composition. In fact, if it had been about eighty times more massive, it would have become a star rather than a planet. On January 7, 1610, using his primitive telescope, astronomer Galileo Galilei saw four small "stars" near Jupiter. He had discovered Jupiter's four largest moons, now called Io, Europa, Ganymede, and Callisto. Collectively, these four moons are known today as the Galilean satellites. ​Galileo would be astonished at what we have learned about Jupiter and its moons in the last 30 years. Io is the most volcanically active body in our solar system. Ganymede is the largest planetary moon and is the only moon in the solar system known to have its own magnetic field. A liquid ocean may lie beneath the frozen crust of Europa. Icy oceans may also lie deep beneath the crusts of Callisto and Ganymede. In 2003 alone, astronomers discovered 23 new moons orbiting the giant planet, giving Jupiter a total moon count of 49, the most in the solar system. The numerous small outer moons may be asteroids captured by the giant planet's gravity. Jupiter's appearance is a tapestry of beautiful colors and atmospheric features. Most visible clouds are composed of ammonia. Water exists deep below and can sometimes be seen through clear spots in the clouds. The planet's "stripes" are dark belts and light zones created by strong east-west winds in Jupiter's upper atmosphere. Within these belts and zones are storm systems that have raged for years. The Great Red Spot, a giant spinning storm, has been observed for more than 300 years. The composition of Jupiter's atmosphere is similar to that of the sun—mostly hydrogen and helium. Deep in the atmosphere, the pressure and temperature increase, compressing the hydrogen gas into a liquid. At depths about a third of the way down, the hydrogen becomes metallic and electrically conducting. In this metallic layer, Jupiter's powerful magnetic field is generated by electrical currents driven by Jupiter's fast rotation. At the center, the immense pressure may support a solid core of ice-rock about the size of Earth. Jupiter's enormous magnetic field is nearly 20,000 times as powerful as Earth's. Trapped within Jupiter's magnetosphere (the area in which magnetic field lines encircle the planet from pole to pole) are swarms of charged particles. Jupiter's rings and moons are embedded in an intense radiation belt of electrons and ions trapped in the magnetic field. The Jovian magnetosphere, composed of these particles and fields, balloons 600,000 to 2 million miles (1 million to 3 million kilometers) toward the sun and tapers into a windsock-shaped tail extending more than 600 million miles (1 billion kilometers) behind Jupiter, as far as Saturn's orbit. Discovered in 1979 by NASA's Voyager 1 spacecraft, Jupiter's rings were a surprise: a flattened main ring and an inner cloudlike ring, called the halo, are both composed of small, dark particles. A third ring, known as the gossamer ring because of its transparency, is actually three rings of microscopic debris from three small moons: Amalthea, Thebe, and Adrastea. Jupiter's ring system may be formed by dust kicked up as interplanetary meteoroids smash into the giant planet's four small inner moons. The main ring probably comes from the moon Metis. Jupiter's rings are only visible when backlit by the sun. In December 1995, NASA's Galileo spacecraft dropped a probe into Jupiter's atmosphere, which collected the first direct measurements of the atmosphere. Following the release of the probe, the Galileo spacecraft began a multiyear study of Jupiter and its largest moons. As Galileo began its 29th orbit, the Cassini-Huygens spacecraft was nearing Jupiter for a gravity-assist maneuver on the way to Saturn. The two spacecraft made simultaneous observations of the magnetosphere, solar wind, rings, and Jupiter's auroras. 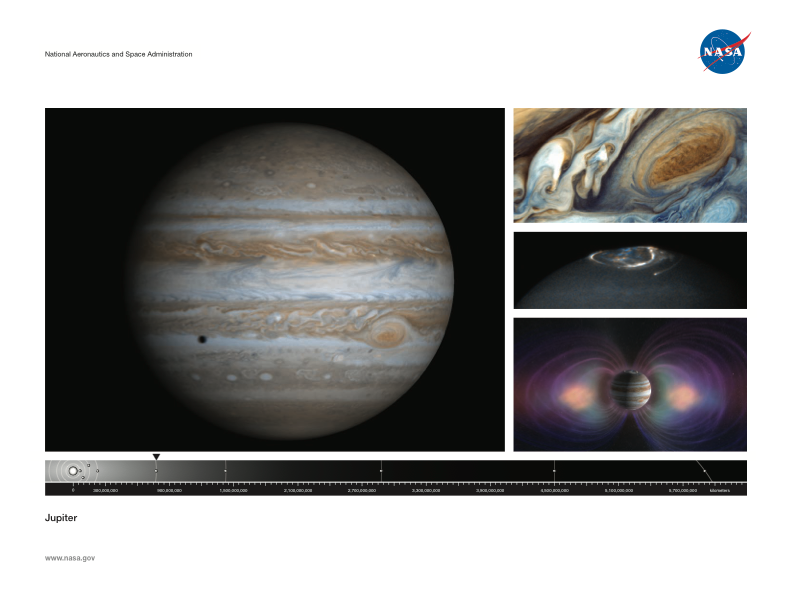 Click on the image below to download the Jupiter lithograph and learn more about this planet.